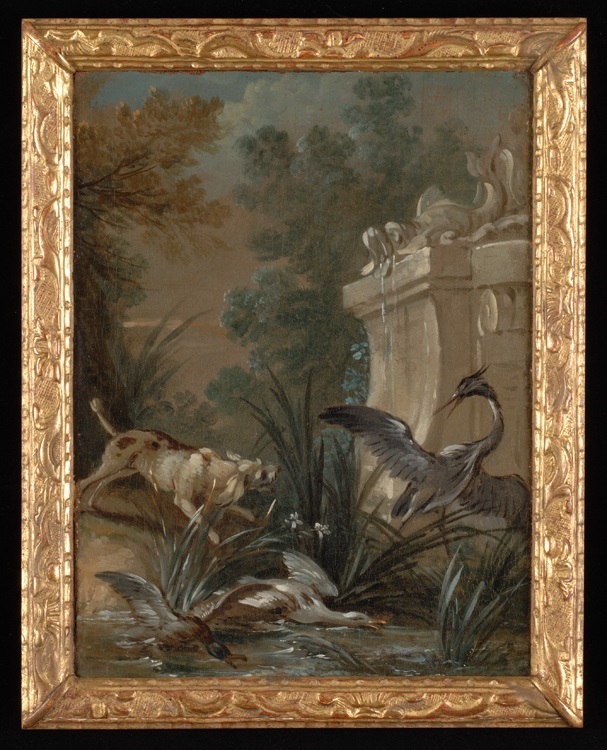 Rectangular depiction of a dog attacking a crane and ducks by a fountain, in a gilt wood frame. Oil sketch for a painting in the Museés des arts décoratifs, Strasbourg. This and a second Oudry work of the same size also at Rough Point were recently discovered to be preparatory sketches for a pair of paintings commissioned by Samuel Jacques Bernard, the comte de Coubert (1686-1753), for the dining room of his grand hôtel on the rue du Bac in Paris, built between 1740 and 1742. The full-scale paintings were removed in 1887 when the hôtel was dismantled and its decorations sold. They are now in the Museés des arts décoratifs, Strasbourg. It isn't known when or where Doris Duke acquired the preparatory sketches. See David Pullins, "Oudry's oil sketches for Samuel Jacques Bernard," The Burlington Magazine CLIX (March 2017), 203-211.